Solar Power World announced Clean Solar has once again been recognized as one of Solar Power World 2018 Top Solar Contractors for the 6th consecutive year. Clean Solar was recognized as one of 450 major contributors to the solar power industry. Of all the residential rooftop solar contractors in San Jose California, Clean Solar ranked #1 and of all solar contractors combined throughout California, they ranked #23. Clean Solar ranks as #85 of residential installers in the U.S.
As stated by Solar Power World magazine, “The Top Solar Contractors list is developed by Solar Power World to recognize the work completed by solar contractors across the United States. 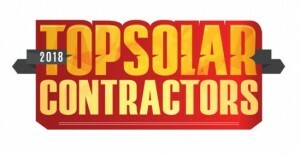 Produced annually, the Top Solar Contractors list celebrates the achievements of U.S. solar developers, subcontractors and installers within the utility, commercial and residential markets, and ranks contractors by kilowatts installed in the previous year.” In 2017, over 10,600 megawatts of solar were installed by Solar Contractors in the United States. Clean Solar was responsible for the installation of 2216.1 kilowatts of solar power, earning the rank of #227 for all solar installers in the U.S. The Solar Power industry continues to expand, with 30% of new electric generating capacity attributed to solar power in 2017. In 2017, the non-residential solar market also experienced expansion, seeing a growth of 28% over the previous year. As the solar industry continues to grow, Clean Solar will continue to strive to provide exceptional customer service, comprehensive custom solar solutions for homeowners and businesses alike, and transform the way Californians view solar.